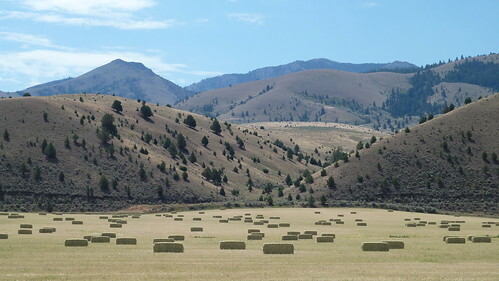 I crossed into Oregon over the Snake River and followed the banks of the Oxbow reservoir in scorching heat along Hells Canyon. 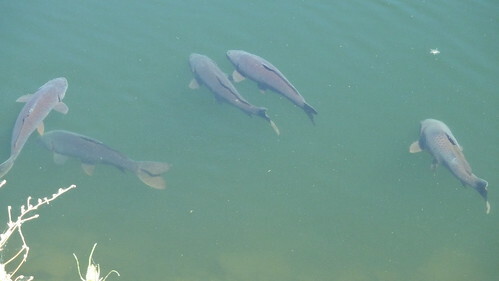 People were Trout fishing in the reservoir whilst the huge shoals of Carp lazed unhindered in the inviting warm water. 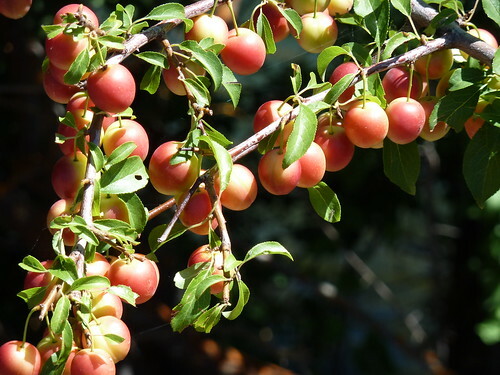 I spotted trees laden with what looked like cherries, but decided they couldn’t be, as no one would allow ripe cherries to sit unpicked. Temptation got the better of me and I decided to bite into whatever this cherry like fruit was. It looked like a cherry, smelt like a cherry and by golly it tasted like a cherry. 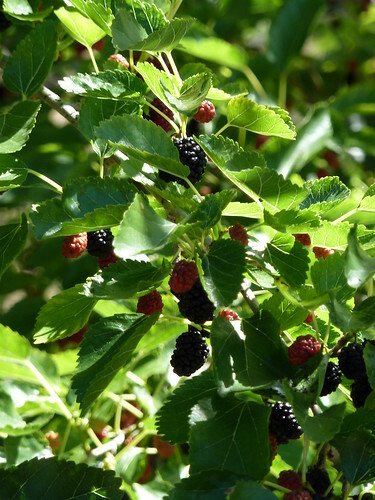 The banks were also full of Tayberries, Blackberries and Peaches; this veritable smorgasbord of free fruit was mine for the taking. Further down the road I spotted a woman picking fruit, the only person on the entire road. I checked with her that the fruit was safe to eat and free to take, she confirmed it was and that people were just to damn lazy to come and pick it, “Put it in a carton and stick a $5 price tag on it and they’ll buy it” she ranted “try and get them down here to pick it, not a chance”, I left the lady with a “What’s the World coming to” sort of expression on her face and pedalled off munching on my bounty. 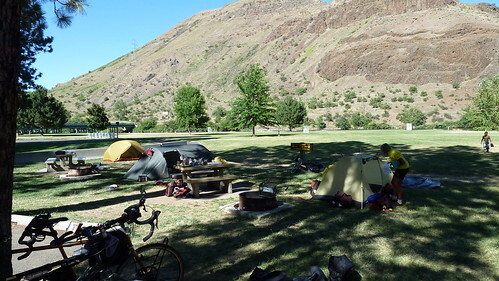 The heat in Hells Canyon had been pretty fierce and the cycling hard; out of the Dutchmen the Ozzies and myself, I was the last person to arrive at Copperfield Camp site at in Oxbow OR, but at least I had a bag of fruit! After a swim in the river to cool off I set up camp next to a big Hispanic family, it was hard to work out who was who in the large family unit but eventually a large guy, dressed like a gangster rapper broke the ice. “Where due guys cycle from?” after the usual text book answer the astounded looking guy and his family crowded round firing off questions at us. “It must be dangerous out there on da road, what due packin” one of the elder lads asked. I started to reel off a list of my pannier contents, whilst the group looked on confused, the father held up a hand to pause me, “Na I think ma bro is askin ya what handgun you is packin”. “Hand gun?” I answered rather bemused, “I’ve got some pepper spray!”. Realising these guys thought I should genuinely be carrying a weapon in order to cycle across America, I explained to them how safe I had felt cycling across his country. Apart from the dogs, Mac trucks, RV’s, red necks etc etc… But generally safe!!! A younger lad piped up “You must av no trouble fightin off da ladies avin a James Bond accent”, I assured him that 3 months on a hard leather saddle with a slightly less fastidious personal hygiene routine than one would normal follow at home, “me trouble wiv da ladies” was that none would come anywhere near me!! I think our encampment of bikes, small tents and little cookers, boiling barely edible meals (apart from the Dutchmen's haute cuisine) was a strange phenomena to our camp site neighbours, they often sat starring at us as though we were circus side show freaks or a fly on the wall documentary! 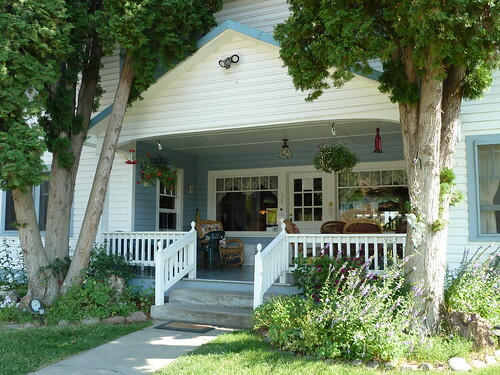 Staying in Oxbow reminded me of Geography at school and how in our curriculum we studied “oxbow lakes”. I could never really work out the reason for this and thought it would have no life long value what so ever. 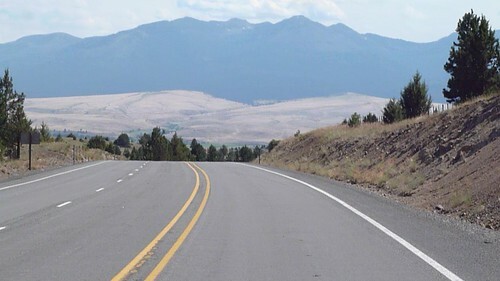 Well on many occasions on my Trans Am ride I’d look down on a valley floor from a hill or mountain pass and see an oxbow lake; it was quite fulfilling to know how they were formed. But Pie R squared, I’ve still found no use for that one! Although I did have some good pie back in Golden City!! 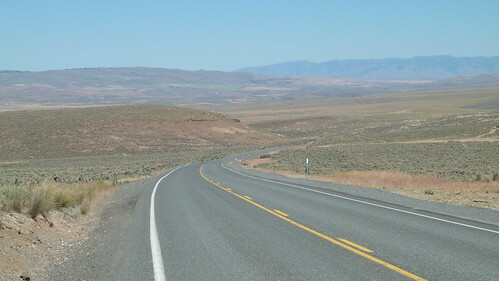 The next day was another toughie, Oxbow to Baker City 70 miles and plenty of climbing in intense heat, with the route following historic areas of the Oregon Trail. Half way through the day on a long slow hill climb through parched barren plains, I wish I’d have had my camera ready, as I saw a sight that made me laugh out loud, but you had to be there! Well you know how dogs look funny when the go passed with their heads stuck out of car windows, I saw a collie that had up the anti. Coming towards me at at least 60 miles an hour the dog had obviously decided that being in the back of a large crew cab pick up was no fun. He had taken on the extreme sport of roof surfing and was happily stood on the roof leaning into the bends, ears flapping! 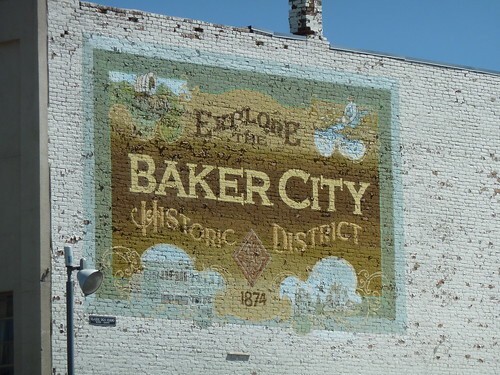 I limped into the pretty town of Baker City, out of water and out of energy, a rest day was called for so I tracked down a $35 motel and booked a few nights. On the first night I had to wear ear plugs as a couple next door had two babies both of whom screamed constantly for 6 hours. Through the paper thin walls I could make out no interaction with the children by the parents and in the morning when I awoke I heard a loud “Oh my God!” from the corridor. I opened the door thinking someone had died, but met the cleaner looking into the recently vacated room confronted by a pile of food wrappers, used diapers and other assorted detritus, the room was ransacked! As I stood talking to her the teenage father returned, having forgotten something after checking out, he didn’t even apologise to the cleaner, just ignoring her and walking out. Bizzare! 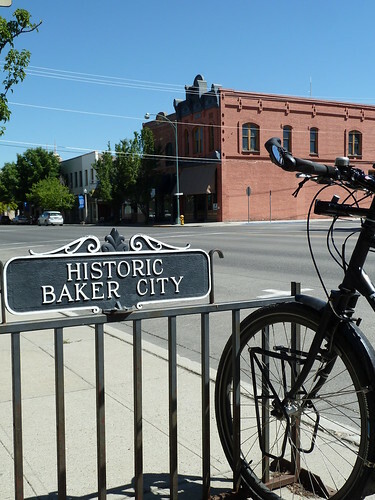 On my second day in Baker City the ACA group caught up, having also suffered a hellish hot ride to get there. A few of us went out for a Chinese; the restaurant had all white American staff with the Chinese doing the cooking, just seemed strange, the other anomaly was the blank look I received when ordering Prawn Crackers. The waitress had no comprehension of what a Prawn Cracker was and they weren’t on the menu; it’s like an Italian restaurant not selling pasta!! 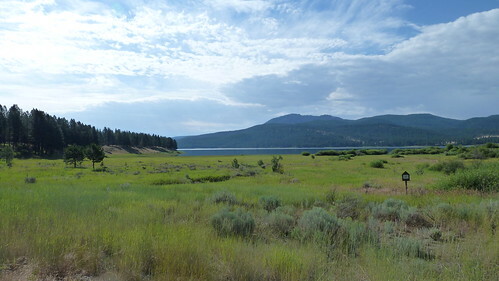 The next day I was up early heading towards Prairie City, with three back to back passes in between and a distinct change of scenery to pine forests, lakes and quiet roads, it was a tough but nice day. Most of it spent cycling with the Dutchmen and we were also joined for lunch by Fred and Barb the intrepid 77 year old Australians. Although stronger climbers than me, the Dutchmen were impressed with my downhill prowess, elbows on my bar ends and tucked in low my heavy weight touring bike would gain momentum and slowly accelerate to an impressive speed (52 mph top speed on Trans Am). A crash would have been disastrous, possibly fatal, but the buzz of a high speed decent has you catching flies in your smile. I was to be given the honouree title of Eddy the Eagle by the Dutchmen. Coming over the last pass of the day the view down out of the Malheur Forest into the valley below was just stunning. I stopped at a look out point and got chatting with a group of people in a camper van, they were so impressed with my cycling adventure they gave me a huge bag of fresh banana cake which went down well with everyone at the camp site later. 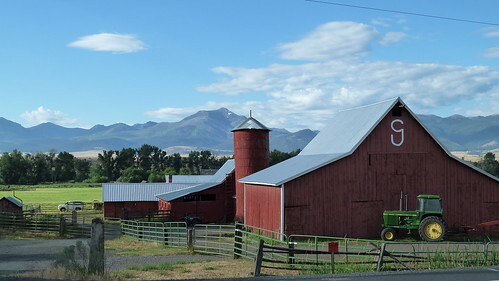 We were to follow the John Day Highway for a few days, through small farming towns along a beautiful valley with a nice night at the Presbyterian Church in Dayville. The church offers great facilities for cyclists to use and you just sleep on the floor; my spot under the pulpit was quite comfy! There was no obligation to do any tambourine bashing or God Squad stuff, in fact you were just left to relax. 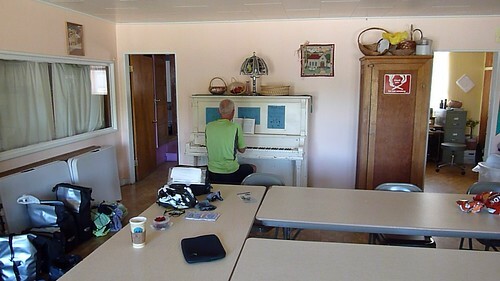 With Hossa the Dutchman cooking up one of his fine meals for everyone, Klaus jingling the ivory on the church piano and me and the Aussies having a good chin wag, it was a great afternoon and evening with probably one beer to many! The next morning we were to awake to torrential rain and the forecast not looking to promising for the rest of the day, we put the kettle on and waited to see if it would clear. After a few hours nothing much had changed and there were mixed feelings in the group about whether to sit it out for another day, Fred was eager to get going, so during a brief lull we donned our waterproofs and set off. The route headed through areas rich in fossils and narrow canyons painted with ancient Indian petroglyphs, we stopped briefly to explore and then started climbing out of the canyon as the rain started to pour. 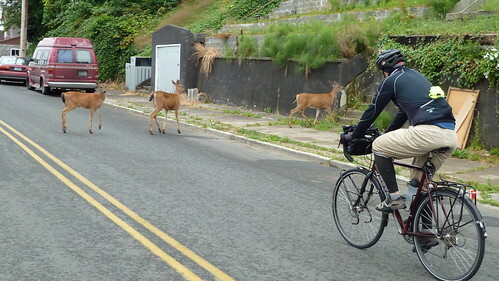 On one narrow section with no barrier and a shear drop an RV almost clipped us as it passed, I saw red and screaming expletives I pedalled furiously after it. My adrenaline kicked in and I was up the steep climb as if it were flat. 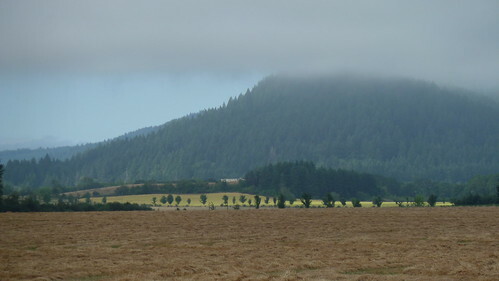 It was the last straw for the Dutchmen, soaked through and with plenty of spare time on their hands they turned round and headed back to Dayville Church. 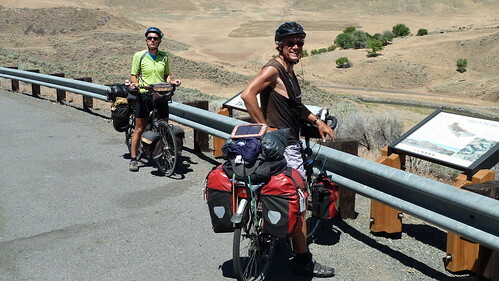 I carried on knowing Fred and Barb where somewhere up ahead on the “river like” Ochoco Highway. I caught up with them just outside of Mitchell and we ended the day at the Oregon Hotel, a lovely original timber building that seemed, like the rest of this small town, to be in a time warp. The ACA group turned up, as well as another small group of cyclists and it meant that the hotel was fully booked and the population of the town probably doubled overnight! 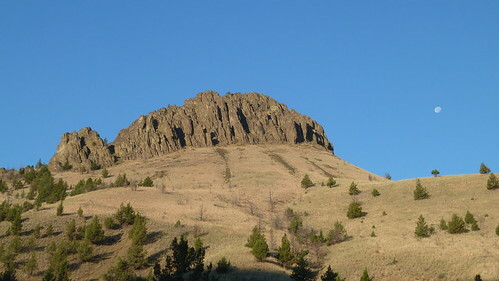 The Painted Hills area out of Mitchell was a real unique landscape with huge rock out crops, almost pyramid like hills with different coloured soil running across them and the steep Ochoco pass to get over. I crested the pass first, not due to speed, just the first one out of bed, Lee from Dorset wasn’t far behind and we stopped at the top gassing until a few other ACA riders turned up. 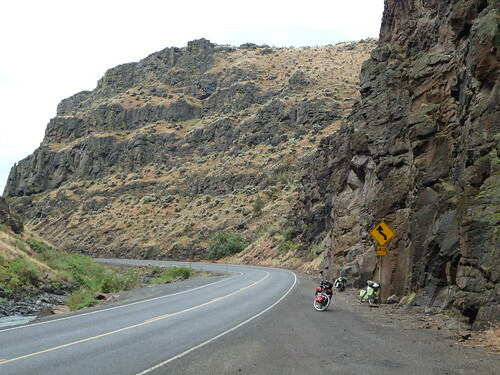 There was one last barrier between me and the Pacific Ocean; the McKenzie Pass (elev. 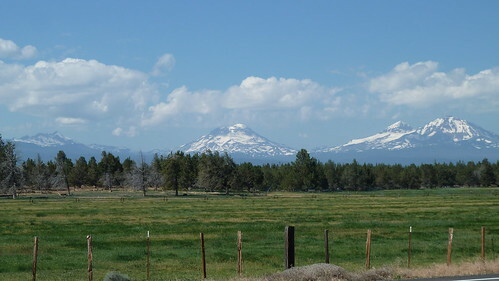 5335 ft/1623 m) and from the camp site in the touristy, but pretty town of Sisters, the three snow capped Sisters peaks, part of the Cascade mountain range looked a formidable finale. The road up the pass is closed for a large part of the year with snow and isn’t accessible by RV’s which makes it a great cycling route, carbon fibre racer boys passed me on occasion using the pass as a training run. 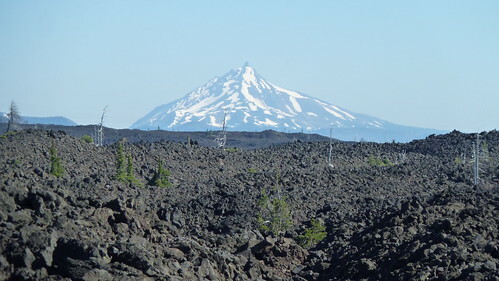 The route is beautiful and nearing the top the forest disappears to leave a bizarre volcanic landscape for miles around, caused by three lava flows 1500 years ago. The descent from the top of the pass was just an awesome sequence of fast switchbacks through pine forest for mile after mile descending thousands of feet, without doubt the best downhill on the Trans Am. 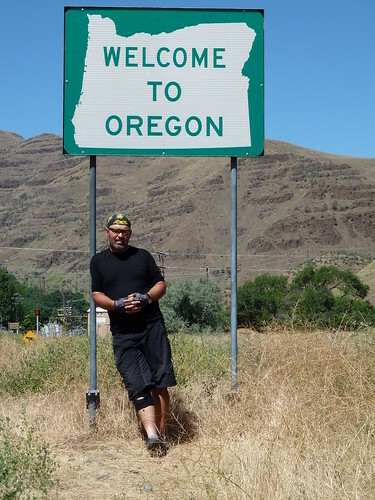 After a few more days of camping with the Dutch, Aussies and ACA riders I was to say my farewells as some where planning to visit a cycle factory in Eugene and take a different route to the coast and some where slowing up as they had lots of days left before their flights home. 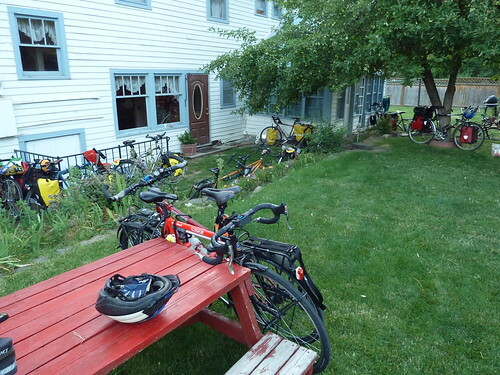 We had a good picnic table party at the RV park in Coburg and I cycled on the next day feeling jaded and sad that the end of the ride was near. 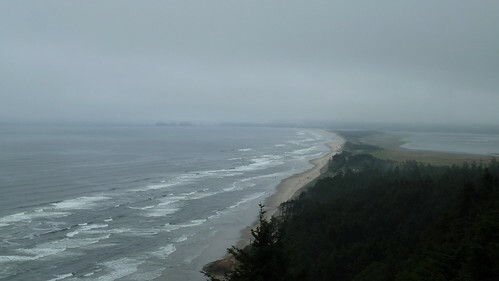 As I got closer to the Pacific coast I could smell the sea air and Oregon's legendary coastal mist clung to my clothes, I almost didn’t want it to appear, but through gaps in the trees the Ocean started to show itself and I pulled into a lay by and starred out into the mist searching for the horizon. I had done it, traversed a continent, ridden 4600 miles, had what seemed like a life time of memories crammed into 3 months, met some some amazing people and seen sites that took my breath away. I had experienced extremes of every nature, heat, thirst, hunger, pain, fear, pure enjoyment and had my faith in humanity restored by the generosity of strangers.Travelling by bicycle puts you in a place that no other form of transport can, you smell the air, you feel the weather, you meet the locals and move slowly across their landscape. 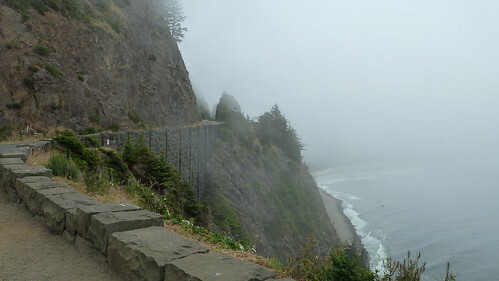 I may have completed the crossing of the USA from coast to coast, but the Official Trans Am route finished a few days up the coast in Astoria, so I cycled on through the mist towards my final destination occasionally getting a glimpse of the coastline. Heading into the town of Seaside there was a friendly beep of a car horn and frantic waving, my friends the Moreland family had driven down from Vancouver island in Canada to meet me, it was strange seeing people I actually new rather than meeting strangers and making friends. We camped at Seaside and I woke early the next morning to carry out the sacred ritual of the Trans Am rider. 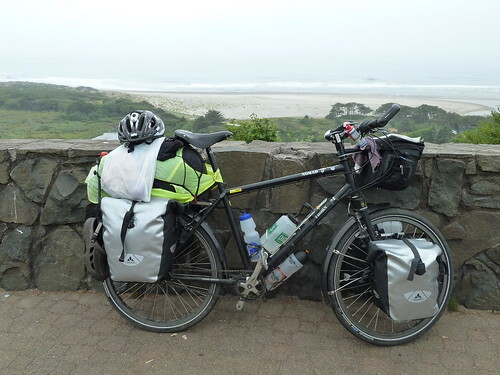 It was time to dip my front wheel in the Pacific, having dipped my back wheel in the Atlantic at the start of the journey. 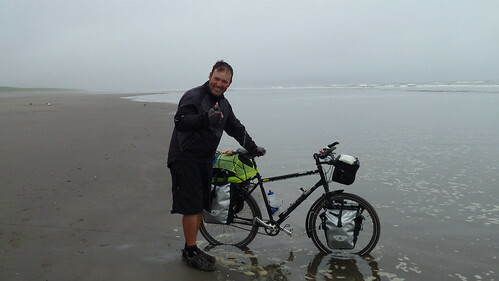 So on the 6th August 2010 on a misty murky morning, my friend Mark followed me down to the beach and took my wheel dip photo. I then met up with Tony, the guy I cycled the first two thirds of the Trans Am with, who had come down from Portland to ride the last 25 miles to the finish with me. 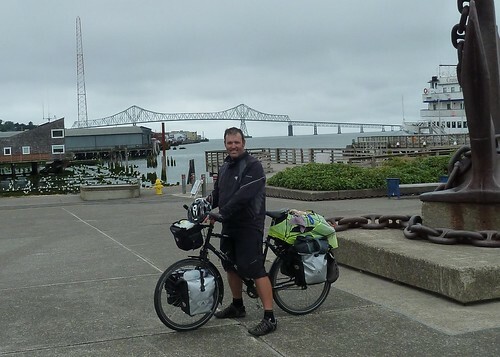 We cycled quiet back roads, catching up with each others news from the last month of the journey and before long we were crossing the bridge into Astoria and heading for the maritime museum and the end point of the Trans Am. There is no plaque or sign to indicate the Trans Am starts or finishes there, so the maritime museums anchor is the ideal back drop to stand on and announce to the world that you are one of a group of cyclists from all over the world that can say they’ve done the Trans Am. 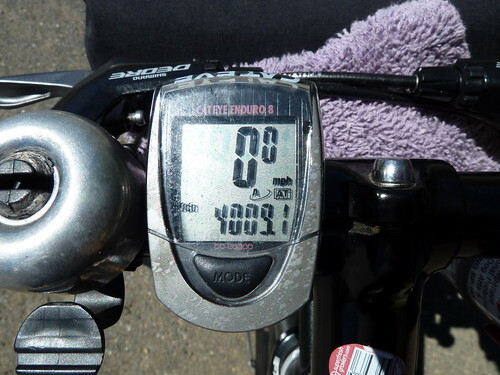 This blog post was written retrospectively, my end of ride post is here. Stay tuned to this Blog, new trip being announced imminently!